Fall is full swing here and I'm loving it. We had so many days of sunshine, with cool evenings and foggy mornings. Makes for some gorgeous sunrises and sunsets. We've just this week started shutting our windows at night instead of keeping them open to let the house cool off. 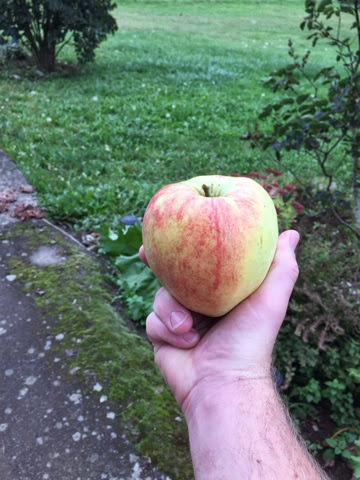 Andrew's hand, with an apple. Our apple trees did great this year, with most of the apples being good enough to eat straight off the tree. Some of them were absolutely huge! Like can't-finish-alone, meal-for-two size apples. When we moved in, our apple trees and our one pear tree were sorely neglected. But Andrew has been tediously pruning and taking care of pests. Every year the apples have gotten a bit better, less skin blemishes and holes. I typically cut up the blemished, bruised apples (from falling on the driveway) and save the good parts to make applesauce. 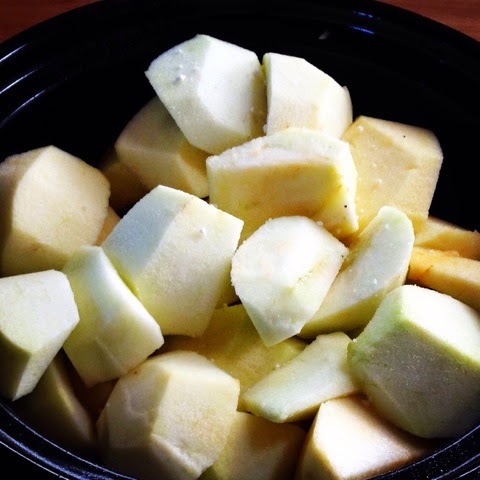 This year is the first year I've had more apples I wanted to save for eating then I wanted to use for applesauce. Means that we haven't bought a box from Bellewood Acres yet (gasp! ), we still have a drawer full of huge, crispy apples and we only about 8 quarts of sauce. I might be able to round up a few more quarts from windfall apples, but...the end of the applesauce is almost here. Also, last year we bought two new pear trees, who each only produced a pear or two this year, but they pollinated well with our old pear tree. We finally got a good amount of fruit off it; a grocery bag full that is in our garage fridge crisping up.